I know most people hate Skyrider, but I loved it! The airtime on the camelback after the loop is incredible, and the last two bunny hops are insane. Sure, the restraints are incredibly awkward, but if you sit(stand) in the front its an amazing ride. I'm not sure why, but to me it just seemed way smoother and more intense than its clones I've been on at King's Dominion (and formerly King's Island). When I went to Canada's Wonderland this past summer, it was one of the few coasters we rode multiple times. I guess I'm just weird, but it's definitely one of my favorites. Less than 4 days left! 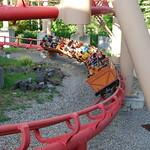 Outlaw Run, my favorite wooden coaster, would slot in at #2 on my list. The only thing I didn't like about this ballot was the Arrow Mine Train grouping. Those coasters are generally quite different, and I didn't like having to lump in my favorite (Thunderation) with some of the lesser mine trains. Last edited by The Great Zo on Sat Mar 29, 2014 3:41 pm. Last edited by cfc on Sun Mar 30, 2014 7:15 am. Michigan's Adventure needs some love too! Just submitted my form now.